A quick moving brush fire surprised Southern California motorists Friday, with vehicles catching fire and people forced to evacuate both their vehicles and nearby homes. According to U.S. Forest Service officials, the wildfire, named “the North Fire,” first ignited around 2:30 p.m. near Oak Hills Road, just north of the 138 Freeway and near the 15 Freeway, which is a major route between Los Angeles and Las Vegas. Dry land, hot temperatures and high wind gusts quickly spread the fire to 3,500 acres, burned five homes, and even ignited passing vehicles. 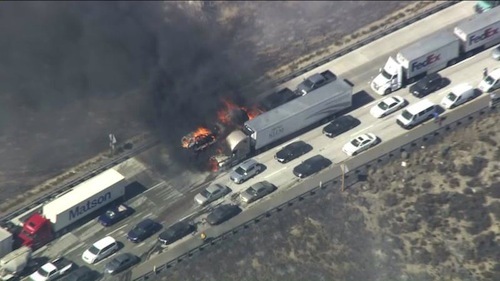 The flames then swept right across the 15 Freeway and burned several more vehicles that were already trapped in standstill traffic. In total, twenty vehicles were destroyed and 10 others were damaged, according to San Bernardino County Fire officials. 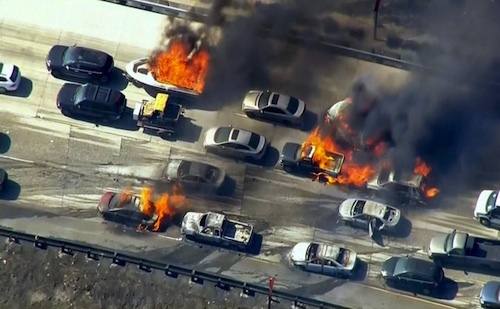 Steve Carapia, spokesman for the California Highway Patrol said 50 to 75 vehicles were left abandoned on the freeway and hundreds of other motorists turned onto side roads to get away from the flames. 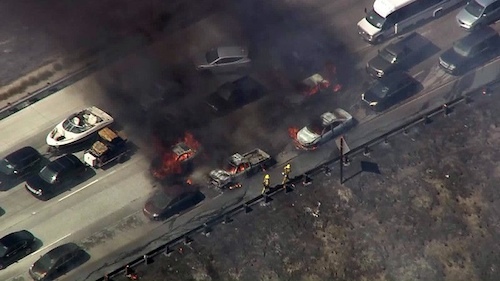 Within an hour, all lanes of the 15 Freeway were closed and firefighters took over, moving between the empty vehicles to put out the flames. They also warned motorists to remain in their vehicles because they were dropping water from fire-fighting aircrafts, which can cause serious injuries upon impact. However, people were continuing to flee their cars and many were seen filing on foot down the shoulder of the road, covering their faces from the smoke. "You could hear the explosions from people's vehicle tires popping from the heat," said Lance Andrade, a 29-year-old railroad conductor from Apple Valley. “You could hear crackling, smoke was coming in every direction, you could feel the heat. We just waited it out and prayed to God." Michigan native, Russell Allevato, was traveling from Las Vegas to Los Angeles with his two teenage daughters, his nephew and his nephew's girlfriend when they got caught in the inferno. "It was total smoke and all the cars just started to stack and the fire got closer to us, and everyone started running up the hill. Hundreds and hundreds of people running up the hill," he said. Unfortunately their rental car was among the vehicles destroyed. "All our stuff was charred and gone," Allevato said. In addition to rescue crews, news choppers quickly rushed to area and captured footage of a black pillar of smoke rising into the sky as cars, pickup trucks, a tractor-trailer and a car carrier loaded with empty vehicles burned on the road. As of early Friday evening only two people suffered injuries and the cause of the fire remains under investigation.